Thirty-six professionals from regional hotels, DMCs and the local wedding planning industry received official certification to promote weddings in the Destination. 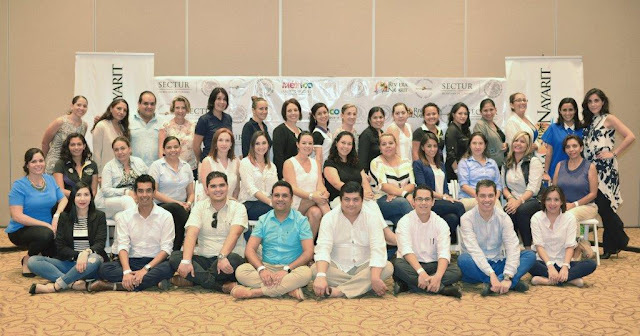 The Destination Wedding Specialist Certification program of the Association for Wedding Professionals International – Diamant Events took place on July 7, 2016 at the Hard Rock Hotel Vallarta in Nuevo Vallarta. The certification program was open to all the professionals working within the Romance Tourism industry, specifically those working with Destination Weddings. The program was designed to be done in one day and included useful courses to help these professionals create strategies for their target markets, learn to communicate more assertively and to maintain the highest quality standards—all of which also serves to benefit the Destination. Thirty-six professionals were certified, including personnel from several area hotels such as Four Seasons, Palladium, Samba, Decameron, Marival Group, Grand Velas, Villa Varadero, Hard Rock Hotel, Iberostar, Sheraton and Villa Group. Well-known area wedding businesses and planners also received their certification, including Prisar Eventos, Details Vallarta, Emmotions Event Planners, Eventives Weddings, L&A Weddings, The Dazzling Details, The Wedding Mexico, Rocco Troyani Signature Events, Vallarta Weddings, Adventure Weddings, Zevi Events & Weddings JJ & BO. Local DMCs specializing in this segment such as Tropical Incentives, TAU Meetings & Events and DMC VTA were certified, as well. The AfWPI is widely recognized on an international level and works closely with Mexico’s Association of Independent Professional Wedding and Event Coordinators (ACIBEP by its acronym in Spanish), which operates for the advancement of its members as well as the development of the destination weddings segment, all with the endorsement of the Mexico Tourism Board and Mexico’s Secretariat of Tourism.